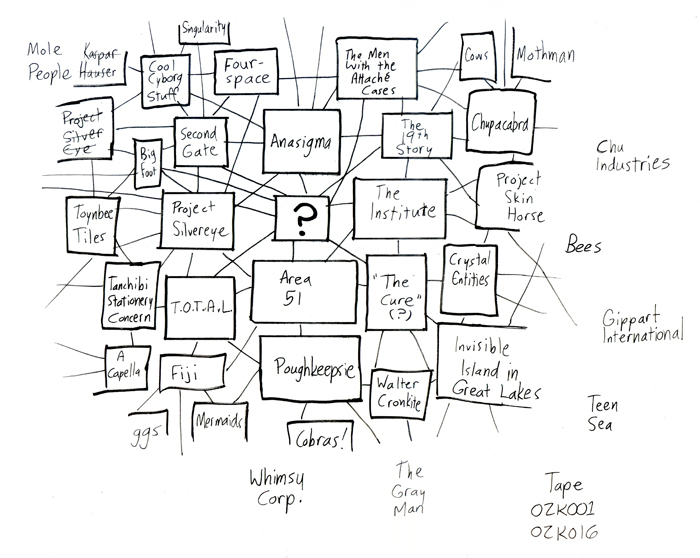 Shaenon: Here’s the image I used for Jonah’s and Nera’s charts of the Conspiracy. It’s about half callbacks to things from past storylines, and half children’s book references. In addition to Project Skin Horse, the code name we all know and love, this chart includes a Project Silvereye. Project Silvereye is… AG-I, the government superhero team. Everyone who’s been wracking your brains trying to figure out what “AG-I” stands for, I’m sorry. It’s a terrible piece of periodic table/YA novel wordplay. Channing: Even I didn’t know that, and I’ve been working on this thing for like ten years now. It didn’t even occur to me to wonder what AG-I was. I figured (correctly, it seems) that the “I” was “eye”, simply based on Panoptica’s uniform. But beyond that, I wasn’t concerned. I knew if the meaning was important enough, it would work its way into one of the stories. Not sure if spelling it AgI would have made the pun more obvious, or just made us wonder why a bunch of superheroes would name themselves Silver Iodide. Mrs. Zarves is behind everything. Don’t be silly. There is no Mrs. Zarves. And still, look at him! There! Behind that, uhm, everything! I was wondering whether the men with the attaché cases were the ones who hang out with the dead rats living in the basement, and the nod to Miss Zarves confirmed it. I know they’re operating off of incomplete information, but if those are the connections they’re making, so are we. Is the Teen Sea near the Ween Sea? I still don’t get the AG-I joke, sorry. Would someone who does be willing to explain it? Thanks. Another name for silver is Argentum, and therefore its periodic table symbol is Ag. And I is pronounced the same as eye. I had assumed it was an acronym. I was thrown off because for some reason I had assumed that the “I” was a Roman numeral, so until now I always thought it was “Argentum One”. Same; I kept thinking it was a one. I need to break out my INWO set. Well, no wonder we had so much trouble. Sorry about the double posting, but I’ve been going through it in more detail, and some of those “references to past storylines” are even more obscure/further abroad: there’s at least two references to Smithson in there, and possibly one to Lil Mell. Is the “Invisible Island in the Great Lakes” a reference to anything other than Nick’s LiveJournal? That’s the only place I have seen it. That and Walter Cronkite are both references to Daniel Pinkwater’s YA novel Lizard Music. That chart won’t make sense until you model it in 3D and rotate properly about the x,y, and z axes. No idea what you would find, but I suspect that there’s a spider at the center of the web. A robot spider named Sweetdaddy Jupiter Velvet? Am I the only one who thinks it odd that Narbonics Labs is nowhere at all on the chart? Nor is the Dave Conspiracy. I’m wondering if the Dave Conspiracy is part of Poughkeepsie, so it doesn’t get its own block. Never break the rules, just bent ’em! Very nice. English and Latin. It should be ‘Salve, Ocule Argenti’. The Eye is being addressed, so it goes into the vocative case, as in The Life of Brian; it’s an eye _of_ silver, so ‘argentum’ takes the genitive. Sorry for the pedantry, and for breaking your rhyme scheme. And here I figured it was a reference to the Sierra Adventure Game Interpreter…because if anything has more ridiculous ways to die than a Choose Your Own Adventure book, it’s a Sierra game. Have we seen the 19th Story yet? It’s directly connected to Anasigma AND Skin Horse there. Had to look it up. Turns out I’ve heard the joke, but never connected it with Paar, as he was a few years before my time. Funny how NBC’s censoring the joke without any warning to Paar prompted him to quit The Tonight Show — without any warning to NBC. And then a critic claiming Paar was “washed up on television” prompted him to return to The Tonight Show less than a month later. Flighty booger, wasn’t he? Huh. And here my brain just read AG-I as AGI (Artifical General Intelligence) and didn’t think twice about it. Go figure. SOOOOOOOOOOOOO much easier to read this way. I thank you, and my eyes thank you. Quietly. After studying this chart extensively, I’ve decided to go to Fiji to investigate further. I was so pleased when I bumped into a Toynbee Tile “in the wild” here in DC. “Cobras” really should read “Hugging Cobras,” which, thanks to Skin Horse, is the term my wife and I use to refer to a Chain of Deals.